WASHINGTON (AP) — Supreme Court nominee Brett Kavanaugh has denied an allegation of sexual misconduct from when he was in high school, seeking to defuse a potential threat to his confirmation as a handful of key senators remained silent on whether they would vote for him. Senate Republicans insist Kavanaugh’s confirmation remains on track. But the allegation has inflamed an already intense political battle over President Donald Trump’s nominee. It also pushes the #MeToo movement into the court fight, less than two months before congressional elections that have seen a surge of female Democratic candidates. 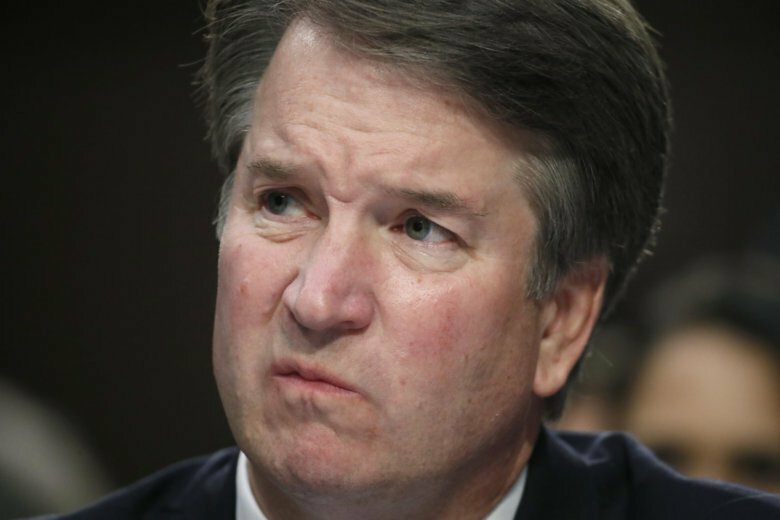 The New Yorker magazine reported that the alleged incident took place at a party when Kavanaugh, now 53, was attending Georgetown Preparatory School. The woman making the allegation attended a nearby school. The magazine says the woman sent a letter about the allegation to Democrats. A Democratic aide and another person familiar with the letter confirmed Friday to The Associated Press that the allegation is sexual in nature. Two other people familiar with the matter confirmed it concerned an incident alleged to have occurred in high school. They were not authorized to speak publicly and spoke on condition of anonymity. The AP has not confirmed the details of the incident alleged in The New Yorker’s account. The New Yorker did not name the woman. Rallying to Kavanaugh’s defense, 65 women who knew him in high school issued a letter saying Kavanaugh has “always treated women with decency and respect.” The letter was circulated by Republicans on the Senate Judiciary Committee. The show of support for Kavanaugh was organized by his former law clerks. Three women reached by the AP said they were first asked to sign the letter on Thursday. “Every accuser deserves to be heard. But a process of verification is also necessary,” Hatch said. The swift pushback comes after the committee’s top Democrat, Dianne Feinstein of California, notified federal investigators about information she received on the nominee. Feinstein won’t disclose the information publicly, but the FBI confirmed it has included it in Kavanaugh’s background file at the committee, now available confidentially to all senators. Kavanaugh’s nomination has divided the Senate, and the new information complicates the process, especially as key Republican senators, including Susan Collins of Maine and Lisa Murkowski of Alaska, are under enormous pressure from outside groups seeking to sway their votes on grounds that a Justice Kavanaugh might vote to undercut the Roe v. Wade ruling. One activist group favoring abortion choice, NARAL, called on Kavanaugh to withdraw from consideration. The Judiciary Committee, which has finished confirmation hearings for Kavanagh, still plans to vote next Thursday on whether to recommend that he be confirmed by the full Senate, a spokesman said. Collins held an hourlong phone call with Kavanaugh on Friday, her spokeswoman confirmed. It had been a previously scheduled follow-up to an initial visit that Kavanaugh made to her office in August. It was not immediately clear if they discussed the new information. If Collins or Murkowski should vote for Kavanaugh, he is likely to be confirmed. Every other Republican in the Senate is expected to vote yes — and some Democrats from Trump-won states may join them — though it remains to be seen if the misconduct allegation will cost him any support. The FBI confirmed that it received the information Wednesday evening and included it in Kavanaugh’s background file, which is maintained as part of his nomination. The agency said that is its standard process. Feinstein’s statement that she had “referred the matter to federal investigative authorities” jolted Capitol Hill and threatened to disrupt what had been a steady path toward confirmation for Kavanaugh by Republicans eager to see the conservative judge on the court. A spokeswoman for Rep. Anna Eshoo, D-Calif., declined to confirm reports that the congresswoman had forwarded a letter containing the allegations to Feinstein. The spokeswoman said the office has a confidentiality policy regarding casework for constituents. A White House spokeswoman, Kerri Kupec, said the FBI has vetted Kavanaugh “thoroughly and repeatedly” during his career in government and the judiciary. The allegation against Kavanaugh prompted a public statement from Anita Hill, who famously accused Justice Clarence Thomas of sexual harassment during his confirmation hearings in 1991. He denied those allegations and was confirmed. Hill, who is now a professor at Brandeis University, urged the Senate to put in place a process for people to come forward. “Even in the #MeToo era, it remains incredibly difficult to report harassment, abuse or assault by people in power,” she said. Associated Press writers Eric Tucker, Michael Balsamo, Mary Clare Jalonick, Zeke Miller and Alan Fram contributed to this report.